Behold. A Fleet of Cars Owned by Nerds. This past weekend, a parking lot in Tokyo's Odaiba glimmered with geek pride. This weekend saw the Ita G Festa expo. Gear-heads gathered and showed off more than their appreciation for automobiles. They showed off their appreciation of covering their cars in otaku decals. "Ita" refers to "itasha", which literally means "painmobile". The removable decals typically feature young female characters from popular anime or PC games. The itasha moniker ironically refers to the pain inflicted on the cars—and the owner's wallet. They're a show of money and a show of just how far someone is willing to go to express their affinity with their favorite game or anime. A subculture of car stickers has existed in Japan for decades, but the stickers were traditionally tuning or racing related, with the occasional right-wing sticker collection. Cosplayers do show up at Ita G Festa, but don't block the view nearly as much as at the recent Dream Party. The fourth annual Ita G Festa was held earlier this year, a month after the earthquake. This fall's Ita G Fest drew over a thousand itasha—comparable to last year's turnout. Itasha are no longer otaku subculture. 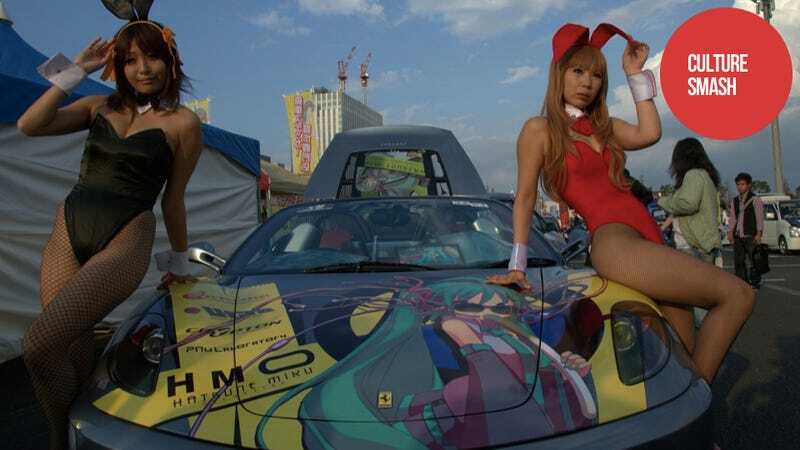 In Japan's Super GT series, itasha racers now regularly compete—with other racers and for otaku attention. Photos courtesy of website Asagawo Blog. More photos: 1, 2, 3, 4, 5, 6 and 7.